Dig your feet in the sand and let the water cool your toes as you escape into the beauty of God's seaside creations, and hear His voice more clearly than perhaps anywhere else. There's nothing quite like the warmth and relaxation of the beach?away from the stresses of the world and into a place of peace and refreshment. Devotions for the Beach is the gentle breeze that takes you there, to see the majesty of God and to open your heart and soul to the One who created it all. These ninety devotions explore the parallels of life with the elements of the shore to help you see God, to find hope, to draw strength, and to rest in the comfort of His arms throughout your day. Included are striking photographs with a fresh, contemporary design for timeless appeal. Every woman will want a copy of this book as a gentle reminder of days at the beach and the call of God's love. There?? ?s nothing quite like the warmth and relaxation of the beach?? ?away from the stresses of the world and into a place of peace and refreshment. Devotions for the Beach is the gentle breeze that takes you there, to see the majesty of God and to open your heart and soul to the One who created it all. These ninety devotions explore the parallels of life with the elements of the shore to help you see God, to find hope, to draw strength, and to rest in the comfort of His arms throughout your day. Included are striking photographs with a fresh, contemporary design for timeless appeal.???? Every woman will want a copy of this book as a gentle reminder of days at the beach and the call of God?? ?s love. 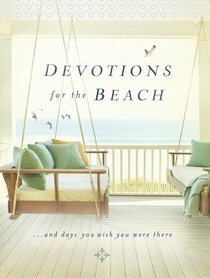 About "Devotions For the Beach"